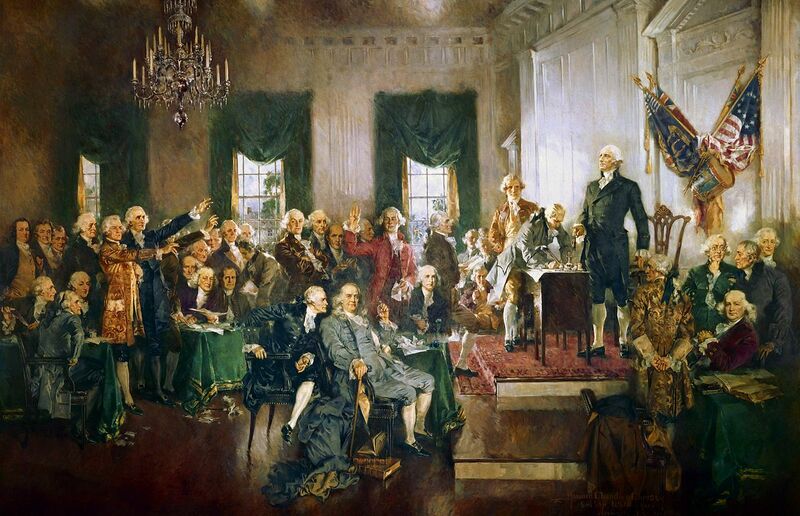 This week, I’d like to recommend Myron Magnet’s book review: ‘It’s Not Your Founding Fathers’ Republic Any More.’ According to Magnet we abandoned the original intent of the U.S. Constitution long ago. The books he reviews suggest many remedies including automatic sunsetting of laws and regulations in the U.S. Code (USC) and Code of Federal Regulations (CFR), respectively. Magnet says President Wilson established in the WWI era the doctrine of the “Living Constitution” administered by the Supreme Court thereby codifying judicial activism that undid civil liberty victories in the aftermath of the Civil War. Secondly, President Roosevelt established prior to and during the WWII era unelected extra-governmental commissions (aka agencies) that have independent legislative, administrative, and judicial powers within themselves. Agencies are created as a matter of course now by legislative action. FDR also strengthened the power of the judiciary to act as a permanent constitutional convention amending the document through their decisions. Magnet states that the Founders original intent was to limit governmental authority through the division and limited enumeration of powers. Only nineteen federal government powers were enumerated. Principle among these were: raising taxes, coining money, keeping the country safe, building post offices and post roads, regulating the armed forces, and making laws for carrying out limited governmental responsibilities. All other powers devolved to the states or the people. Flawed through compromise (in the bad sense), the Constitution was amended from 1865 and 1870 via the Thirteenth Amendment which freed the slaves, the Fourteenth assuring black Americans citizenship and civil rights, and the Fifteenth that prohibited states from denying black citizens the right to vote. In 1876, the Supreme Court, in their United States v. Cruikshank decision, threw out a federal indictment of Louisiana murderers for conspiracy to deprive more than 100 freedmen of their constitutional rights, on the grounds that the killers had violated no federal rights that extended to the states, citing the Slaughter-House Cases. This decision led Southern Democrats to enact Jim Crow laws. Cruikshank smoothed the way for Plessy v. Ferguson, in 1896, which enabled Southern states to segregate transportation and schools and outlaw interracial marriage. No doubt a great deal of nonsense has been talked about the inalienable rights of the individual, and a great deal that was mere vague sentiment and pleasing speculation has been put forward as fundamental principle…Living political constitutions must be Darwinian in structure and practice…The chief instrumentality by which the law of the Constitution has been extended to cover the facts of national development has of course been judicial interpretations—the decisions of courts. The process of formal amendment of the Constitution was made so difficult by the…Constitution itself that it has seldom been feasible to use it; and the difficulty of formal amendment has undoubtedly made the courts more liberal, not to say more lax, in their interpretation than they would otherwise have been. Although the Supreme Court deflected attempts to control the national economy, executive pressure during the New Deal swayed the Court’s 1942 Wickard v. Filburn decision. Filburn, a dairy farmer, was fined for not limiting his wheat crop in accordance with the Agricultural Adjustment Act. The act was meant to curb a perceived deflationary overproduction crisis (held, at the time, to be a cause of the Depression). Congress established the act based on the Interstate Commerce Clause. The act established a crop quota system by state. These quotas were then allocated to individual farms by the states. Filburn used his wheat locally to feed his cows. But the Court decided that his wheat competed with wheat in commerce (he could have purchased it instead of growing it) so, therefore, it was subject to the Commerce clause and the act’s quotas. In the same period, FDR noted, “The practice of creating independent regulatory commissions, who perform administrative work in addition to judicial work, threatens to develop a ‘fourth branch’ of Government for which there is no sanction in the Constitution.” He was responsible for numerous legislative Acts and their associated bureaucratic agencies. I must admit, with everything going on lately, I became overwhelmed. I’m sure it’s happened to you too. Please forgive the hiatus. We’ll cover two special topics from Professor Siegel’s book Revolt Against the Masses in the future.